Key Landscape has many resources for your lighting needs. We have small lights that are built into the retaining walls, lighting to make a stairway safer at night, under lighting of trees and shrubs or to make a dark area brighter. Installing landscape lighting is the next step to achieving a safer and more dramatic, brightened landscape. Landscape lights can accentuate trees, hedges, water features, and architectural structures in your home or property. They create unique visual effects that make the outdoor surroundings so appealing. But it is important to consult a professional when installing this feature. 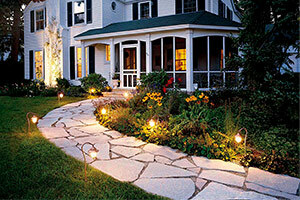 Key Landscape and Irrigation is the company you can count on for installing landscape lights in your property. We create a professional design plan to make sure that the installation of your landscape lighting meets your desired visual effect and ambience. We take into consideration your needs as well as your existing space, location, and landscape features when installing these lights. Call us at (603) 352-6496 so we can talk about the details of your lighting project. Highlighting the beauty of a landscape is no easy feat. 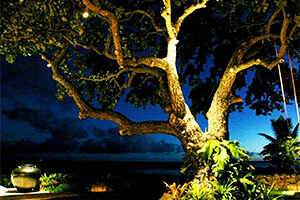 You need certified landscape lighting installers with installation experience. At Key Landscape and Irrigation, we have brightened most of New Hampshire’s residential and commercial landscapes. We can install spotlights to highlight your trees and bushes, floodlit your driveway and entryway or accent those ivy vines adorned around your pergolas. Uplights. Can highlight certain landscape features such as a water feature or a tree trunk. The application can be floodlit, directional or spotlight. Path lights. Small spots containing built-in light capped with a diffuser. We use them to light a path, such as a walkway or a driveway. Wall lights. May or may not be draped, hanged or integrated into walls to create lighting effects. Bollard lights. Can be round, dome-top or flat-top fixtures. Mostly used for parking lots, walkways, park pathways, and gardens. The use of energy-efficient lighting not only enhances and secures your property but also gives you great savings on electricity cost. LED lighting systems are green-living alternatives that are often used for accent lighting, path lighting, and several other outdoor lighting applications. They come in a wide array of designs that can be installed in different ways to create varied landscape lighting themes. Contact us today to get a free landscape lighting installation quote.